Winter brings my birthday, Christmas and well, more than the odd reason to treat myself. Plus with the big (and small) brands outdoing themselves with so many new products, limited edition collections and Christmas products…well, I’ve been spoilt for choice when it comes to streamlining my Winter Wishlist. I love that Christmas and holiday collections are getting bigger and better every year. So naturally my Winter Wishlist features some one-off or seasonal goodies. But it also features some treats that I’ve had my eye on for a while, and that the old bank balance prohibits. But hey, a girl can dream right? Michael Kors Jet Set Tote – well, Santa, I’m starting big here okay? I know you’re on a budget big guy, but if you could find it in your heart to pull one of these out of your sack, I’d be a happy girl come Christmas morning. Clarins Cleansing Kit Duo – is it just me, or is Christmas (and your birthday) the time you stock up on the products you use all the time? I spend so much money throughout the year on my staple products, that it’s nice to ask the parentals to pay for one as a gift? More more for me to spend on eyeshadows and pretty things after all. Nap Queen Candle – because, well. I am the Nap Queen. Nuff said. Alphabet Spotty Teacup – because if there’s anytime to get pretty things with your initials on, it’s Christmas and your birthday right? And these Bombay Duck teacups are just so pretty. Tiffany Bracelet – well, since visiting Tiffany’s in New York and treating myself to my worn daily beautiful necklace, I’ve admired the matching bracelet from afar. Plus what girl doesn’t want to wake up on a special occasion day to a little blue box with white bow? Charlotte Tilbury Lip Kits – I use my current Charlotte Tilbury Lip Kit all the time, it’s amazing quality and the colours in her collection are perfect for me. At £49 each, they aren’t cheap but they are fully acceptable to ask Santa to fork out for. I think. 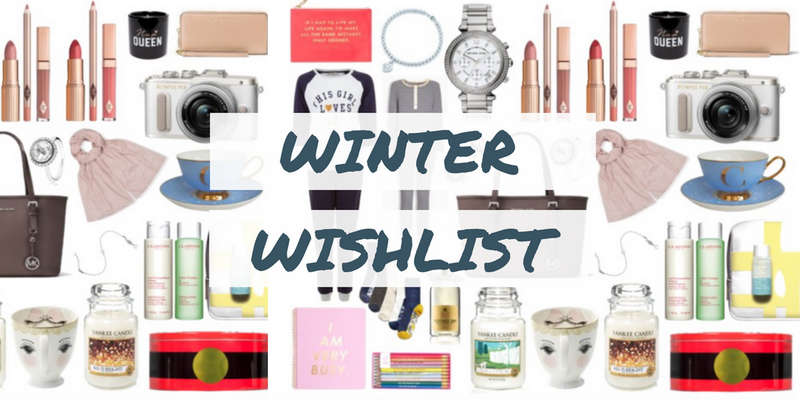 Click away on the collage to browse my Winter Wishlist. What do you think, are any of these on your wishlist this year? And if not, what’s gracing your lust list?